What's missing? (I only use it to remap a couple of keys). This is my current Karabiner configuration file. It's 12,000 lines long (condensed). I kind of dread transferring it all to JSON but it will have to be done at some point. As for things missing, I need to figure out how to define this block in new Karabiner. Which makes a certain key a custom modifier key (sticky key). And I also need to map Simultaneous keys like I can do here. Apparently you can use this to achieve the sticky key behaviour on Karabiner Elements. I need to get myself a second mac to test it and I can't. ? And simultaneous keys are not possible yet from what I know. So yeah, if both these things get added, I will get on the Highest Sierra available. It’s extremely rare for a thread to be removed from the forum, but the thread you’re referring to was a particular case where the discussion was unnecessarily negative, repeating the same statements ad nauseum, and veering off-topic. We allowed the discussion to come to its natural conclusion, and left it for long enough for all parties involved to read it, then removed it. Hope this clarifies why this thread was removed, and we can put this matter to rest. Yeah, I do the sticky key thing--essentially, launcher mode--no problem. I use tab, spacebar, and spacebar-shift for that, but you can use any key_code to enter a mode and any key-code to create sub-modes, or sub-layers, or whatever people like to call it. Sub-modes are easier using modifier keys, though. I created a Home Row launcher using only the homerow of keys, 'a', 's', 'd', and 'f' as sticky keys. Simultaneous key, no. And I've tried many logical things to achieve longpresses, but nothing works without side effects (something happens on key up or the character gets passed through as if it were typed alone). Thank you @Vero. I understand why the thread was hidden and you are right it was probably overly negative and at times repetitive. I am just happy my post was not lost so I can link to it from my wiki. You can always share your config on GitHub for all other people to see and gain inspiration from. ? At 12,000 lines, that's definitely something you write a script for. Has nobody written one already? A second partition or disk should be enough. Only professional developers have extra devices just for testing stuff, and it's always old machines. On the contrary, it was a productive and intelligent discussion among thoughtful, experienced users who are also paying customers. It was honestly critical and honestly praiseworthy as appropriate. The topic was to compare user experiences of Alfred and LaunchBar, and it stayed on topic quite well. When points are being debated back and forth, that is neither unnecessarily negative nor repetitive. Why not honor everyone who put time and labor into the forum, restore it, and let readers decide what they think? Perhaps edit out the posts that merely characterize what other people have written rather than responding to content with content. I suppose I can write a script for it. Only thing I am not sure is what the JSON equivalent of it will be yet to write such a script. Has nobody written one already? I doubt such script exists. Because I know 0 people who actually use Karabiner in this way. Or at least they are not sharing their configuration. Speaking of configuration, @deanishe dotfiles would be really cool to see. A second partition or disk should be enough. I haven't thought of this. I will certainly try it. Macs are pretty resilient to things from my experience. I haven't tried the whole two keys at once approach yet and will look into what @nikivi has done. It was largely a rehash of previous threads on the same topic, and yeah, it was kinda going in circles. There really wasn't much new or worthwhile (in the sense of "worth preserving for posterity") in there. @nikivi's comment that I reposted above was a clear stand-out in terms of adding something new (which is why I reposted it). The purpose of the forum isn't to be a platform for debates, no matter how interesting: it's is to help Alfred users have a better Alfred experience, and hopefully, to be a friendly and welcoming place for Alfred users. That thread was another example of the XY problem. It was framed in terms of Y ("Why isn't Alfred more like Launchbar?") instead of X ("How do I do XYZ in Alfred?"). The nature of the thread violated the "why" of the forum, and my getting stroppy at going in circles violated the "how". So the thread got hidden. I'm sorry for my part in getting the thread hidden. Going forward, how about you try to frame your questions in terms of X, not Y, and I'll try to not be a nob? Haha. Not any time soon. You'd think that all I can do is workflows, but I have a load of webapps, Qt-, TkInter-, asyncio- and Twisted- based programs just for me. Because I can't be bothered to re-write them to fix all the dumb stuff I did in the first version and make them "ready for release". 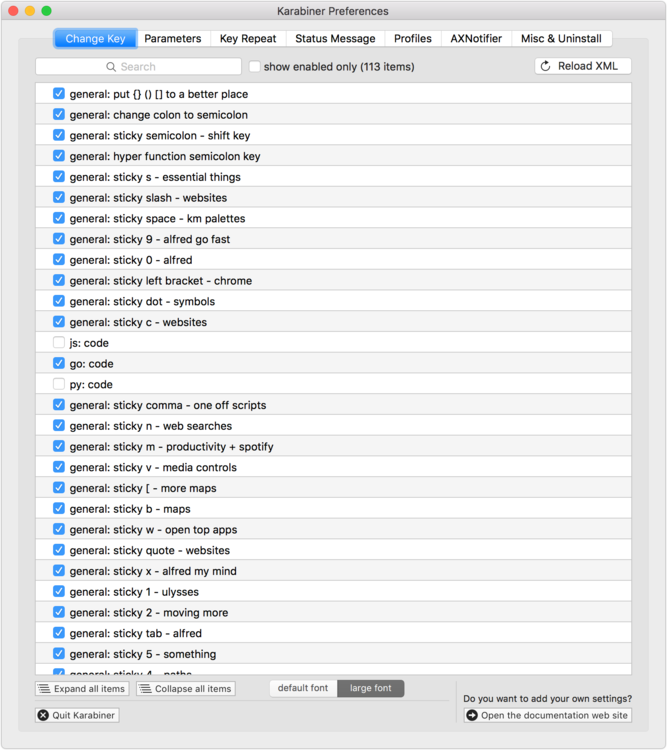 (future) tab + spacebar => workflows and actions and tab (above) only launches URL's. All suggestions and comments welcome. I myself am currently toying with the whole simultaneous key trigger thing from karabiner pointed out by @nikivi. This let's you navigate through Alfred without leaving the keyboard row(Takes some getting used to atm). Btw do you guys have a collection of Typinator phrases or overall a snipped collection? This looks really painful to me. Why not use traditional HJKL vim bindings? For me its S + HJKL to move around. Oh and the cool thing also is that S + V held will emulate shift key being pressed. So I can S + V + L and visually select text to the right. I share my Typinator snippets here. I also share my KM macros here. I am in the process of fully moving nearly all my KM macros there. And if you use SnippetsLab, you can import my snippet library here if you want. I try to make my entire workflow and everything fully transparent and interchangeable so you or anyone else can pick out pieces of my workflow you like and use it or just steal ideas from. That's actually an even better approach. I'll search your Karabiner setting in Github and implement it. How have you set backspace or is it not replaced? My delete key is S + D.
All my configuration is mapped as a map here. It's easier to navigate it if you own MindNode and you download it locally. I wish there was a Karabiner remapping forum available. I would live there. @nikivi thanks for sharing all of this. it certainly takes some getting used to, but i can already say that this way of binding i move my hands less and its more efficient. Only Problem is that i have to force my mind to adapt at the moment. Also that i changed now capslock single press to esc. I have had the Hyper key functionality, but just now added the esc single press. I have issues with my own machine when Karabiner glitches out. I have to restart and cry. Fortunately, this nearly never happens. This whole thing started from me trying out Brett Treppstra's hyper key for caps lock and then thinking, why not do this for every single key. It's insanely powerful especially if you combine it with Alfred and the amazement that Keyboard Maestro is. My advice is to make a mental map of what key is responsible for what and after using it, you just remember things. No need to memorise things explictly. Also find a way to super quickly iterate on it. And then I can add my changes and jump around the XML file with prefixes (i.e. _alf def or _km def or sticky g). And then I use this to instantly refresh the config. I believe Karabiner Elements has something similar. I always wondered why so many people shared things and their code for free. Now I understand. Open Source is addicting. No need to memorise things explictly. Also find a way to super quickly iterate on it. My advice is to make a mental map of what key is responsible for what and after using it, you just remember things. Im also using Keyboard Maestro palettes for various apps that are already helping a lot. thats pretty interesting tho as i make a lot of changes at the moment. 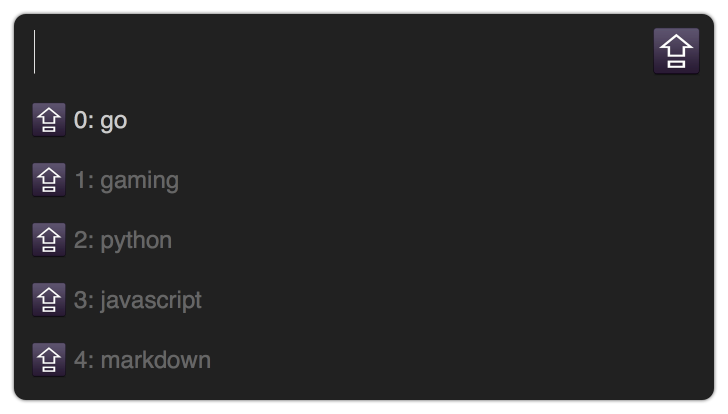 Better to refresh via script than pressing the button in karabiner. Do you have any settings tipps? Like Karabiner Parameters related? the fuzzy, powerful search. Just try to justify the value for it with some more opinions. that you control via keyboard. Is that something you use often and find it really useful? General category is actually my normal mode category. But I use few profiles for programming things. The only difference between these profiles is the P sticky key does different things. The general profile is my Go profile. So P + f will insert `fmt.Println()` or P + G to insert log.Printf() and move caret between brackets (I use that a lot for debugging). Also P + W will insert `workflow:` which is @deanishe AwGo library magic argument for workflows. I try to write many workflows, often failing but still trying. I optimise things for fast retrieval and memory. So I can do anything as fast as 1 second and I always can query things in case I forget something. I also structure things to scale. 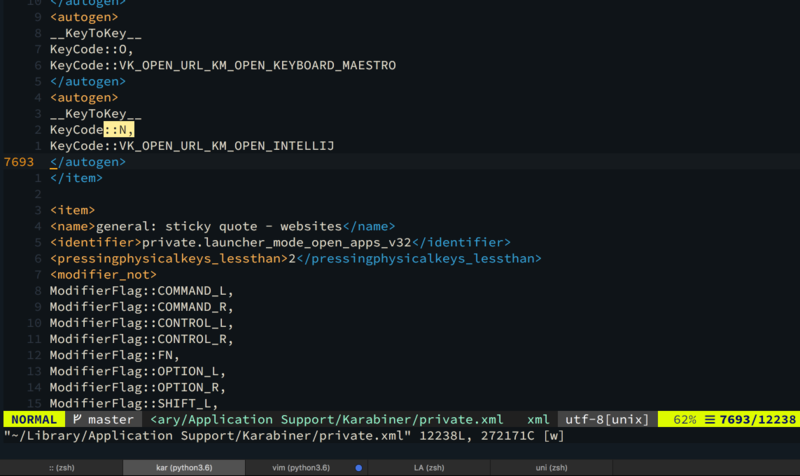 Also the only keys that are not sticky for me are HJKL because sVim and vim mode. I do use D + G to center mouse to current window a lot though. what is your biggest advantage of Typinator over Alfreds textexpander? When TextExpander pulled their money and data grab, Alfred’s snippet expansion was extremely limited (didn’t even have a cursor macro). I had an old Typinator licence, so it was cheap to upgrade, and it imported TextExpander snippets almost perfectly. I don’t do anything super-advanced with snippets*, but I do use forms quite a bit to enter multiple values. AFAIK, with Alfred you’d need to write a workflow to do that, which is an awful lot more work. Maybe 60 minutes to do what takes 60 seconds in Typinator. Also, Typinator expands more reliably. * I use native snippet engines when coding. An engine built into the editor is far more powerful, as it can use the editor’s own API instead of the clipboard and simulated keypresses.